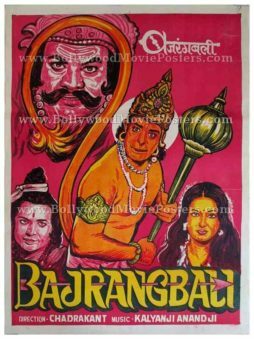 Indian mythology poster of the old Bollywood movie Bajrang Bali (1976) for sale. 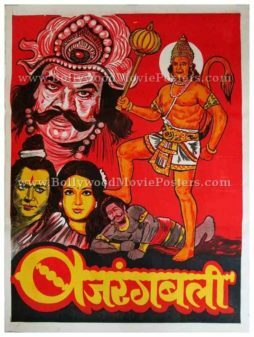 This is an actual surviving vintage Indian mythology movie poster of the 1976 Hindi film that featured award winning wrestler turned Bollywood actor, Dara Singh in the lead role as Hanuman. 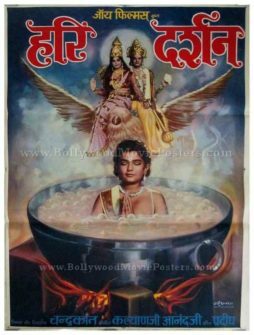 Printed and circulated a few years after the first release of the film (somewhere in the late 1970s), this Hindu mythology poster was printed for publicity of the re-release of the film but never ended up being used. This hand drawn Indian mythology poster was originally designed in oil on canvas format by well known artist G.R. Kareker, making it highly collectible. 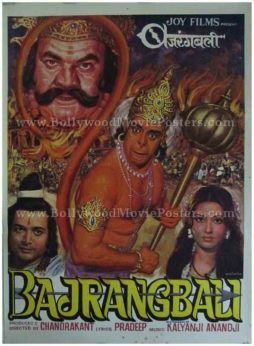 Wrestler turned Hindi film actor Dara Singh playing the role of Hanuman, is depicted in a stunning portrait prominently on the center of the poster with Ram and Sita flanking each of his sides. Raavan’s evil face is depicted inside Hanuman’s tail, signifying triumph of good over evil. The typography used for the film’s title shows an arrow piercing its length, revealing the action genre of this mythological Hindi film. 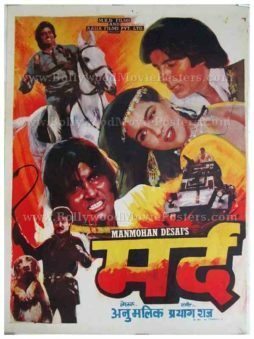 Rare, handmade Bollywood poster of the hit Hindi film Mard (1985) for sale. 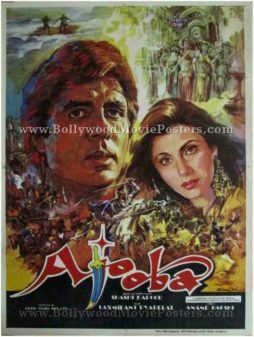 This is an actual surviving old Bollywood movie poster of the 1985 classic, which featured the greatest superstar of Indian cinema, Amitabh Bachchan in the title role. Printed and circulated a few years after the first release of the film (somewhere in the late 1980s), this old Bollywood movie poster was designed for publicity of the film but never ended up being used. This old handmade Bollywood poster features multiple photo stills of superstar Amitabh Bachchan in various action as well as romantic poses, over-painted with a brush to give the poster a hand painted effect. 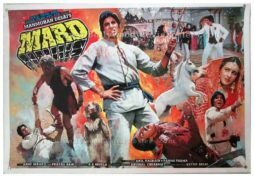 Amitabh Bachchan's two animal friends from the movie, Wonder Dog Moti as well as the intelligent horse are seen in the poster. 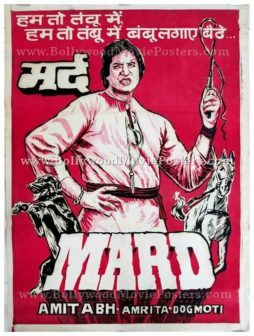 Quirky, hand drawn old Hindi film poster of the hit Bollywood movie Mard (1985) for sale. 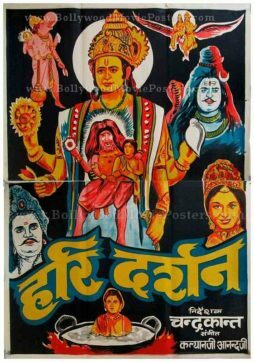 This is an actual surviving old Hindi film poster of the 1985 classic, which featured the greatest superstar of Indian cinema, Amitabh Bachchan in the title role. Printed and circulated several years after the first release of the film (somewhere in the early 1990s), this vintage Bollywood poster was designed for publicity of the film but never ended up being used. This poster was originally designed on a hand drawn canvas by a small time art studio in Kolkata, further increasing its collectible as well as quirk quotient. This old hand drawn poster features a quirky painting of Amitabh Bachchan at the center holding a whip in his hand, in his trademark style (hand on the hip). His two animal friends from the movie, Wonder Dog Moti as well as the intelligent horse are seen in quirky hand drawn avatars on either side of the poster. 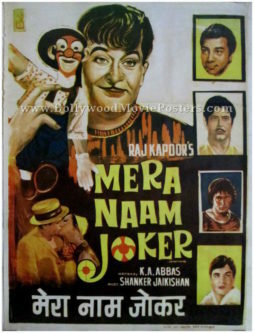 The hand drawn poster is set against a light red background and capitalizes on the success of a song from the film by announcing its lyrics on the top of the poster, “Hum To Tambu Me, Hum Toh Tamboo Mein Bamboo Lagaye Baithe.” Wonder Dog Moti is duly credited in the star cast at the bottom that is depicted using hand drawn lettering / typography. 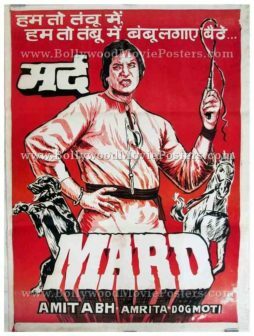 Quirky, hand painted old Bollywood movie poster of the hit Hindi film Mard (1985) for sale. 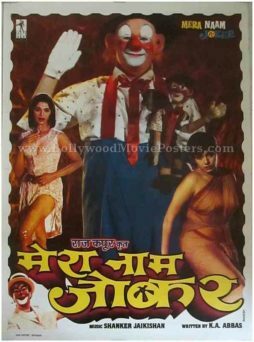 This is an actual surviving vintage movie poster of the 1985 classic, which featured the greatest superstar of Indian cinema, Amitabh Bachchan in the title role. Printed and circulated a few years after the first release of the film (somewhere in the early 1990s), this old Bollywood movie poster was designed for publicity of the film but never ended up being used. This poster was originally designed on a hand painted canvas by a small time art studio in Kolkata, further increasing its collectible as well as quirk quotient. This old hand painted vintage Bollywood poster features a quirky painting of Amitabh Bachchan at the center holding a whip in his hand, in his trademark style (hand on the hip). His two animal friends from the movie, Wonder Dog Moti as well as the intelligent horse are seen on either side of the poster. 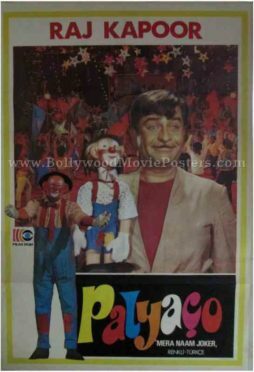 The hand painted poster is set against a maroon purple background and capitalizes on the success of a song from the film by announcing its lyrics on the top of the poster, “Hum To Tambu Me, Hum Toh Tamboo Mein Bamboo Lagaye Baithe.” Wonder Dog Moti is duly credited in the star cast at the bottom. Superb old Bollywood movie stills of the hit Hindi film Mard (1985) for sale. 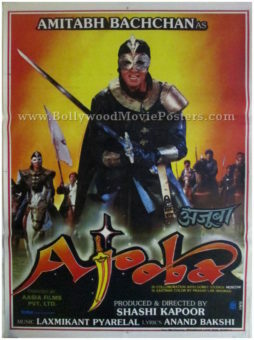 This is an actual surviving set of six vintage movie lobby cards of the 1985 classic, which featured the greatest superstar of Indian cinema, Amitabh Bachchan in the title role. Printed and circulated a few years after the first release of the film (somewhere in the late 1980s / Early 1990s), these old Bollywood movie stills were printed for publicity of the film and were actually used inside a theater that screened Mard! The four corners of each lobby card feature punched holes and display tell tale sings of being displayed on the notice board of a movie theater. These old Bollywood movie stills were originally designed by cutting out images of actors from separate still photographs (shot on set location) and pasting them on a board. The background and typography are hand drawn / hand painted, which makes these old Hindi movie stills an interesting mix of two very different design techniques. This action packed old Bollywood lobby card set was originally designed as a still photo collage on a board by the greatest and highest paid Bollywood movie poster artist of all time, Diwakar Karkare. 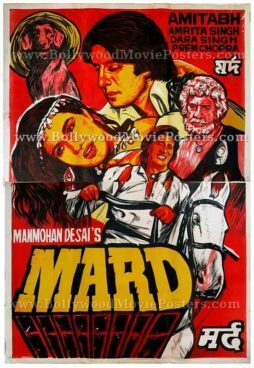 It is believed that Mard was one of the last Hindi films that Diwakar Karkare designed publicity material (posters, lobby cards & booklets) for, before eventually quitting the business and folding up his art studio (Studio Diwakar). Diwakar Karkare’s original signature is seen at the bottom of each lobby card, making this set highly collectible. These old Bollywood movie stills feature photographs taken from iconic scenes of the action packed film. Superstar Amitabh Bachchan is seen in various avatars on these lobby cards along with his romantic interest in the film, Amrita Singh. These old Bollywood lobby cards were printed on glossy, thick photo paper and comes ready for display on a noticeboard (it features four punched holes, one on each corner for easy pinup). 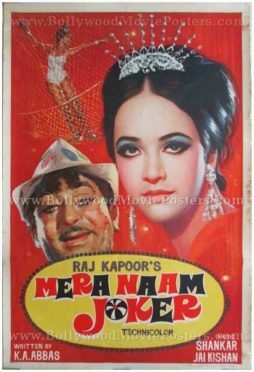 Unlike old Indian cinema posters, vintage Bollywood movie lobby cards are smaller in size and usually cardboard mounted to make them sturdy enough to be displayed on a notice board. These cards were typically displayed in foyers and lobbies inside cinemas, and were generally issued in sets of 8, 12, 16, 20, etc. Most Hindi film lobby cards have punched holes on each of their four corners for easy pinup on a cinema notice board. 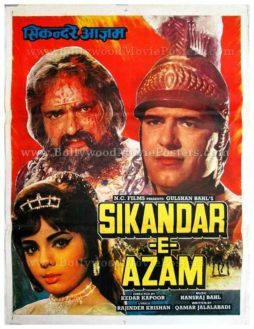 Original vintage Bollywood poster of the hit Hindi film Sikandar E Azam (1965) for sale. 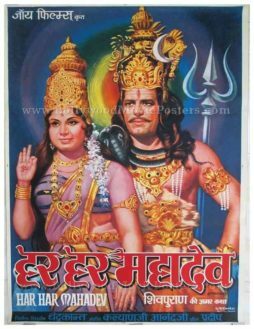 This is an actual surviving movie poster of the 1965 film that featured award winning wrestler turned Bollywood actor, Dara Singh in the lead role opposite Mumtaz. The poster depicts a large cut out photograph of lead actor Dara Singh dressed as Alexander the great. 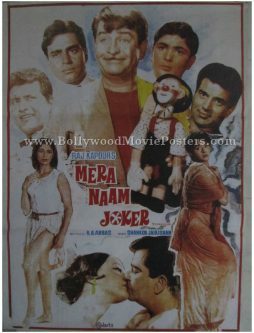 Prithviraj Kapoor and Mumtaz are also seen in the poster as cut outs. 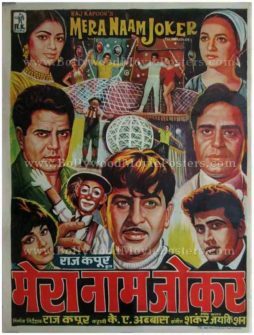 Typography used in the poster is completely in English except for the title translated in Devanagari Hindi on the top left. Sikandar E Azam (1965) is an action film starring the only professional wrestler turned action hero in Bollywood, Dara Singh. In the film, Dara Singh plays the role of (Alexander) while Prithviraj Kapoor is seen as Porus in the film. Starting from 1963, Dara Singh partnered often with Mumtaz. The two were seen together in over a dozen Hindi films and soon became the highest paid actors at the time.